Nike's newest innovation isn't so novel your great-grandmother wouldn't recognize it. In fact, the sportswear giant employed an age-old technique to solve a modern conundrum: how to create a lightweight shoe that fits like a sock but has the support of a trainer. Its Flyknit sneaker, which will debut in time for the London Olympics, uses both flat and circular knitting technologies to create a featherweight, formfitting, and virtually seamless upper. Even with Kevlar-reinforced filaments knitted in for structure, the upper and tongue weigh only 1.2 ounces. The entire shoe clocks in at an impressive 5.6 ounces for a size 9—19 percent lighter than the Nike Zoom Streak 3 worn by the first-, second-, and third-place athletes in the 2011 World Championships men's marathon. A concept four years in the making, the Flyknit required teams of programmers, engineers, and designers to develop the specialized upper, which was inspired by runners who wanted a shoe that hugged the contours of the foot like a second skin. A pliable material like yarn has no structure or durability, however, which means the same qualities that make a sock so desirable are impractical for a running upper. The shoe was inspired by runners who wanted a shoe that hugged the contours of the foot like a second skin. Nike couldn’t just stitch a tube sock to a sole; it had to map out a precise framework of knit and cabled structures to provide the necessary support, flexibility, and breathability in a single layer. Because the one-piece upper doesn’t use multiple materials and cuts that traditional footwear demands, the Flyknit also has the additional benefit of reducing waste. 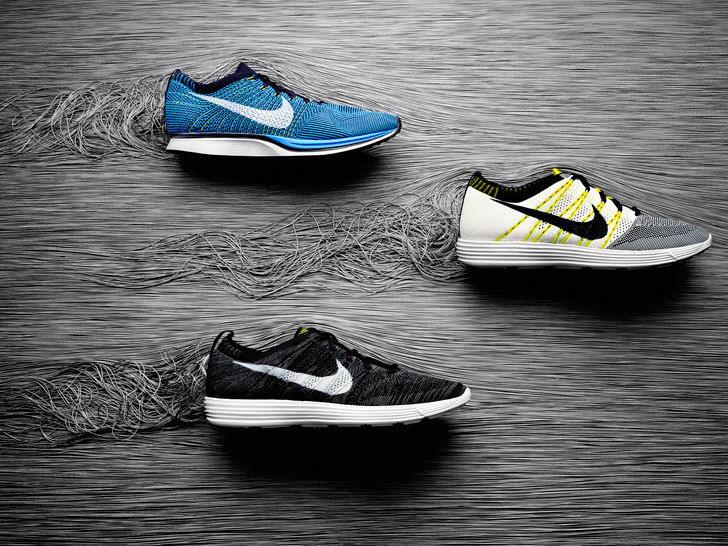 “Nike Flyknit is truly a minimalist design with maximum return,” a spokesperson says. Mark Parker, Nike’s president and CEO, says the shoe will revolutionize the running world. And well, we’re inclined to believe him. A concept four years in the making, the Flyknit required teams of programmers, engineers, and designers to develop the specialized upper. It was inspired by runners who wanted a shoe that hugged the contours of the foot like a second skin. A pliable material like yarn has no structure or durability, which means the same qualities that make a sock so desirable are impractical for a running upper. Nike couldn't just stitch a tube sock to a sole; it had to map out a precise framework of knit and cabled structures to provide the necessary support, flexibility, and breathability in a single layer. Because the one-piece upper doesn't use multiple materials and cuts that traditional footwear demands, the Flyknit also has the additional benefit of reducing waste. Mark Parker, Nike's president and CEO, says the shoe will revolutionize the running world. And well, we're inclined to believe him.